Photo: President Edwards (left) joins David Sebastian (center) and artist David Slonim (right) at the unveiling. A portrait was unveiled for Dr. David L. Sebastian, former dean of the Anderson University School of Theology, on Tuesday, Jan. 20, 2015. David Slonim, a local artist, painted the portrait. Dr. Sebastian was the longest-serving dean at the School of Theology when he retired in July 2014, having begun his tenure in 1995. He taught courses in leadership, preaching and evangelism. 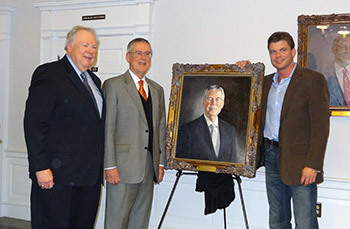 “The first portrait was done by Dr. Sebastian himself, by the life that he has led and his example,” Dean Dr. James Lewis, dean of the School of Theology, said. Sebastian remains a sought-after preacher in the Church of God. He also continues to serve the university and the church through special assignments in preaching and church leadership support. More of Slonim’s oil paintings can be found among corporate, museum and private collections nationally. His work has been featured in American Art Collector, Western Art & Architecture, Southwest Art, Big Sky Journal, USArt, Plein Air Magazine, and Indianapolis Monthly. Solo exhibitions at regional museums include the Richmond Art Museum in Richmond, Ind. ; Minnetrista Cultural Center in Muncie, Ind. ; and Anderson Center for the Arts in Anderson, Ind. Anderson University is a private Christian university in central Indiana. Anderson University continues to be recognized as one of America’s top colleges by U.S. News and World Report, The Princeton Review, and Forbes. Established in 1917 by the Church of God (Anderson, Ind. ), Anderson University offers more than 60 undergraduate majors and graduate programs in business, music, nursing, and theology. This entry was posted in All Church of God, Colleges & Universities, Great Lakes and tagged Anderson University, AU, David Sebastian, School of Theology, Seminary, SOT. Bookmark the permalink.